UTV Motion Pictures have confirmed officially that their big-budget Chiyaan Vikram starrer Thaandavam is confirmed to release on September 28. The AL Vijay directed actioner is a multi-starrer and has Vikram, Jagapathy Babu, Anushka, Amy Jackson, Santhanam, Nassar and Lakshmi Rai in the lead. It is G V Prakash’s 25th film as a music composer and has camera by Nirav Shah and editing by Anthony. 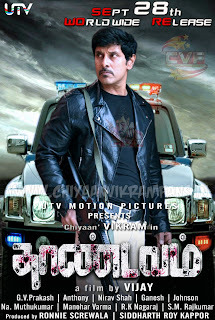 Thaandavam is one of the most eagerly awaited Tamil films of the year. Chiyaan Vikram's mind blowing performances in this film will definitely going to be a visual treat for his fans and Tamil audience. 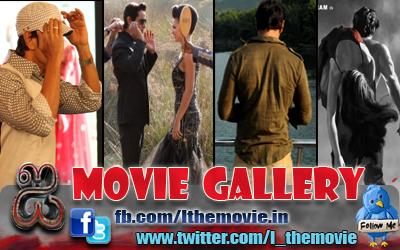 Vikram plays a blind character which been inspired from the real life character Mr. Daniel Kish from America. Kish is coming down to Chennai on 12th September to meet the local press and share his experience.